Modern wooden pallets have been a staple in the transit and packaging industries for nearly 100 years. Wood pallets are durable, reusable, stackable, and come in a wide range of sizes. When thinking about wood pallets, one thing to keep in mind is that we do live in a world with limited resources, and wood is one resource that needs to be used wisely. After a wooden pallet’s job is done for one company, that pallet can be reconditioned and re-used by another. 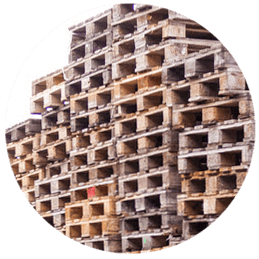 This practice of buying and supplying used wood pallets is a service that Direct Supply is happy to offer our customers. We are used wood pallet buyers. Our large inventory of used pallets is due in part to our ability to purchase them from businesses that no longer have a use for them. We are proud to be able to offer these pallets to our customers at a great rate after having them go through our rigorous inspection process. Some of the pallets may not pass our inspection as-is. For example, some used pallets exhibit signs of rot due to moisture, or the lumber may show stress cracks from an overweight load. When this occurs, we either salvage them by reconditioning them or we recycle them into usable lumber or wood chips using our resource-efficient wood pallet recycling process. These quality checks are in place to ensure that you’re getting top quality products at a reduced price. There are a few ways that opting for used pallets instead of new pallets is a smart business move. The first is that they save your business money. You’ll pay less for our reconditioned wood pallets than you would pay for the same pallets brand new. We ensure that they’re still in excellent condition, so this is a win-win for your business. Consumers are very interested in doing business with companies that are conscious of the environment, and since trees are a limited natural resource, choosing used wooden pallets is a very green activity. Show off that your company is environmentally friendly and working towards upholding the three Rs: reduce, reuse and recycle. Having these used pallets on hand isn’t just a cost-savings advantage. It can also be a time savings for you. Since we store all of the used pallets that we have on site, when you place an order for used pallets, we’ll be able to get them out to you right away! Don’t see a size you need? There’s a good chance that we have the size you need available, so be sure to check with us to see what we have in stock. Contact us today about how we can help you save money, time, and the environment with using our inspected and reconditioned used wood pallets.